We will accept highly motivated new (less than 10 years of farming experience) and beginning fish farmers and aquaponic producers from across Ohio and the Midwest into our Intensive program. Intensive applicants will be expected to participate in 12 one-day training exercises usually held the second Saturday of each month, three additional aquaculture workshops throughout the year at various locations, and attend an annual bus tour of farms. 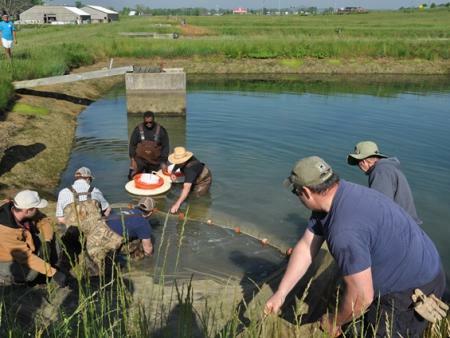 The main facility is located at the OSU South Centers Aquaculture Research Center in Piketon, Ohio, and other cooperating aquaculture-related facilities across the state and region. The training addresses aquaculture and aquaponics production, business planning, and marketing. You may have a business partner, but no two members of the same immediate family or business will be selected into the program at the same time. Participants will be responsible for all expenses (i.e. travel) related to getting to and from the training sessions. If you are interested in the program, please submit a completed application to Jordan Maxwell (ABC-2 Program Coordinator) by October 31, 2017. Upon review, all applicants will be notified November 15th, 2017 if they were accepted into the Intensive program. If you are not accepted into the ABC-2 Intensive program or do not feel you are ready for the commitment, you will have the option of joining our ABC-2 Intermediate program to participate in informative workshops, farm tours, and network with our industry leading mentors. If you are new to the industry the ABC-2 Introductory program is great to learn more about aquaculture or aquaponics through the sharing of information and resources and contact with our staff by phone and email support. You can download the ABC-2 Intensive application at go.osu.edu/apply_abc2.